The five manatees recently fitted with satellite transmitters are doing what researchers hoped – spending plenty of time in and around Naval Submarine Base Kings Bay. The pilot project involving the Navy, DNR Nongame Conservation Section, Georgia Aquarium, Sea to Shore Alliance and others is aimed at understanding how these endangered mammals use Cumberland Sound near the base, and habitats along the rest of the Georgia coast. 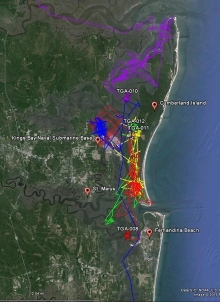 When last checked, the tagged manatees were within five miles of the base, although two weeks before they were spread from St. Augustine, Fla., to St. Simons Island, with one venturing up the Satilla River. Each appeared healthy and was behaving normally, according to DNR wildlife biologist Clay George. This planned multi-year project marks the first time manatees have been tracked in Georgia using GPS. Call DNR at 1-800-2-SAVE-ME (800-272-8363). 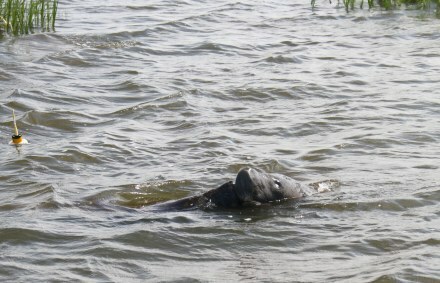 Note the time, date, location, tag color and whether other manatees are present. Do not chase, touch or otherwise harass the manatee, or touch the tag (which floats on the surface behind the animal). Manatees are protected by federal and state law. 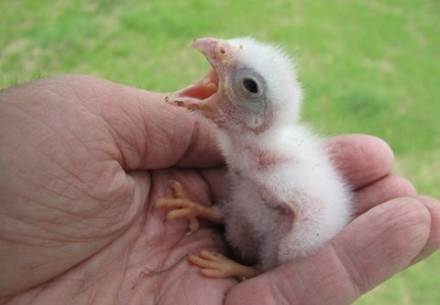 A high-powered nest box project in Georgia is helping North America’s smallest falcon. Southeastern American kestrels, a subspecies of the falcons often called sparrowhawks, declined an estimated 80 percent over the last half of the 20th century. The main culprit is habitat loss, including fewer suitable cavities for nesting. Of Georgia’s breeding populations, the largest is along a transmission line reaching west from Pierce County, through Tifton to Georgia Power Co.’s Plant Mitchell near Albany. Georgia Southern University research showed that hollow cross-arms on the power poles provide critical nest sites (“Power in towers for kestrels,” January-February 2008). However, the hollow cross-arms are gradually being replaced as they rust with solid ones. Some 30 boxes have been added. 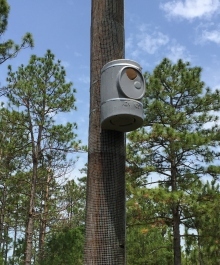 And while nest boxes (example at left) are more vulnerable to predators than a cross-arm far above the ground, DNR Nongame Conservation Section surveys marked an average 17 percent annual increase in the Tifton line population, and an estimated 302 nesting pairs in 2014. DNR senior wildlife biologist Nathan Klaus is interested in applying survey data to fine-tune where boxes are placed. “Using nest box and helicopter surveys to develop models, we’ve almost tripled our rate of box use” in Fall Line sandhills populations of southeastern kestrels, Klaus said. He’s also hopeful that a proposed nest box program, coupled with habitat restoration in the region, could help save a dwindling population of kestrels that is down to about 25 breeding pairs along a Macon-Columbus transmission line owned by another company. Got questions about the revised SWAP? We have answers. Check out this FAQ . And don’t forget to review the draft of the revised plan, and provide comments to help shape it, online or at one of the following public meetings. 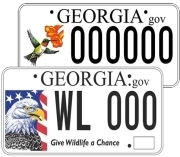 Wednesday, July 1: Georgia Wildlife Federation, 11600 Hazelbrand Road, Covington. Tuesday, July 7: Go Fish Education Center, off I-75 (Exit 134), Perry. Wednesday, July 8: Susan Shipman Environmental Learning Center, Georgia DNR Coastal Regional Headquarters, One Conservation Way, Brunswick. A statewide strategy to conserve populations of native wildlife species and the natural habitats they need before they become rarer and more costly to conserve or restore. Created and put into practice by more than 100 conservation partners and stakeholders, including wildlife agencies and organizations, academic institutions, companies, and private landowners. A wide-ranging effort involving species and habitats, varying from golden-winged warblers and gopher tortoises to Georgia asters and longleaf pine savannas. Required by Congress for state wildlife agencies to receive State Wildlife Grants, the main federal funding source for states to conserve nongame wildlife. Some stranded sea turtles recover after being rescued; and, unfortunately, some don't. 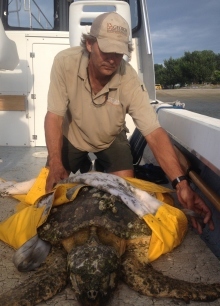 Nongame Conservation Section and Georgia Sea Turtle Center staff carried this loggerhead found about a week ago at Little Cumberland Island to the center on Jekyll Island. But, sick and emaciated, the turtle died two nights later. Georgia’s Marine Turtle Stranding Network works to recover, document and rescue stranded turtles. Strandings are the primary index for the myriad threats marine turtles face in coastal waters. Stranding updates. Bass anglers photographed an immature brown pelican recently on the Little River Arm of Clarks Hill Lake (J. Strom Thurmond). Though common on the coast, brown pelicans are seldom seen that far inland in Georgia, according to DNR wildlife biologist Todd Schneider. Areas of Pelican Spit and St. Simons Island’s East Beach used by nesting seabird colonies have been roped off, part of DNR efforts to monitor and conserve beach-nesting birds. Nongame Conservation Section staff have also banded more than 19 American oystercatcher chicks so far this season on Ossabaw Island, Pelican Spit and Little Egg Island and Ogeechee bars. Remember to share the beach this summer! The New Guinea flatworm, a highly invasive species, has made its way to Florida. A recent report says the voracious worms that grow up to 2.5 inches long and devour snails were found at several sites in Miami-Dade County, posing a threat to native invertebrates. It may be slow but this black box turtle below is turning heads. 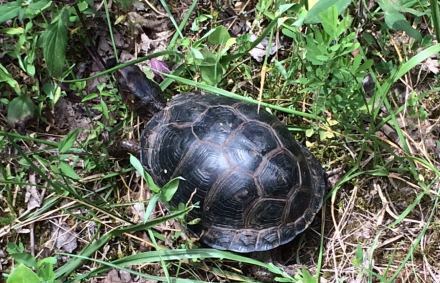 The turtle was found June 18 trying to build a nest along a road near Canton. Melanism, a development of dark-colored pigment and the opposite of albinism, is rare in eastern box turtles. The only light-colored pigment on this turtle, since released, is a small orange spot near each ear, writes DNR senior wildlife biologist John Jensen. Learn how to increase your land’s value at the 2015 Agroforestry and Wildlife Field Day, Sept. 17 at the UGA campus in Griffin. More than 30 topics varying from prescribed burning to creating wildlife openings will be showcased, with continuing education credits available. More than $17 million in financial and technical aid to help landowners nationwide protect and restore wetlands is being offered through the U.S. Department of Agriculture’s Wetland Reserve Enhancement Partnership. 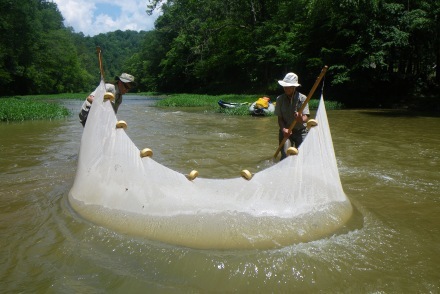 July 31 is the deadline for proposals to the Natural Resources Conservation Service. Learn more about such programs in the updated Landowner’s Guide to Conservation Incentives in Georgia. One ton of ivory was crushed at Times Square June 19 to raise help awareness of and stem illegal trade in ivory and the elephant poaching that underlies it (event video). Following the U.S. Fish and Wildlife Service’s first Ivory Crush in 2013, several governments on other continents also destroyed ivory, highlighting the international scope of the issue. Loggerheads nesting at record pace. A fine vine for hummers. 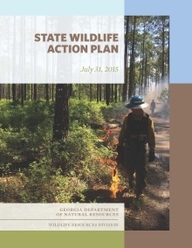 "Comment needed to help shape revised wildlife plan," Georgia Forestry Association. Also: Coastal Courier. ** Map of manatee travels as of June 24. Image taken under USFWS research permit MA37808A-0.